CVTA Office and physical address. It's in the "Rite Aid" building, next to City Hall in downtown Montpelier. We're on the second floor, inside the Central Vermont Regional Planning Commission. CVRPC is open regular business hours, Monday through Friday. This is also where we host public meetings from time to time. Public parking is availabe right behind building. (There are meters.) 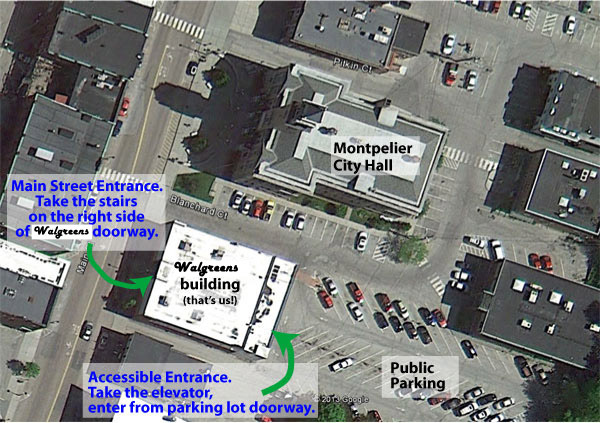 Note that the Accessible entrance is through the door from the parking lot, at the back side of the building, where there is an elevator. Truth to tell, we spend most of the time outside of the office - out on the trail. If you stop by and don't see any CVTA person in the office, give a call or email. We check messages regularly from the field. 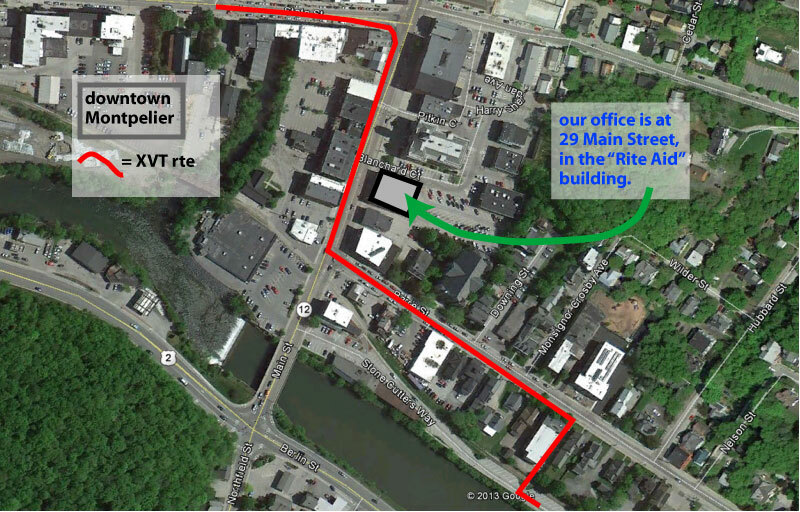 Our office is in downtown Montpelier. We're in the "Rite Aid" building, next to City Hall. On the second floor, in the Central Vermont Planning Commission office. We are proudly affiliated with the Central Vermont Regional Planning Commission. Their help "beneath the hood" allows us to stay focused on our mission, doing work out on the trail. CVRPC provides to CVTA office space and logistical support. They sponsor other organizations, as well. Learn more about the work of CVRPC HERE.